If you are just starting as a postgraduate student, or if you missed orientation in September, there will be a morning of postgraduate orientation on Friday 18th January 2019. This will cover student services in Trinity, the student-supervisor relationship, thriving as a postgraduate student and a Library tour. Details of the timetable are available on the timetable page. Congratulations on choosing Trinity College Dublin! If you have accepted a place in Trinity, we hope you are looking forward to beginning your studies next month. On this webpage, we provide you with some information about Trinity's Graduate Students’ Union (GSU), the organisation which is the main representative body for postgraduate students in the University, and of course information about Trinity's Postgraduate Orientation Week 2017, a crucial week to get your postgraduate studies off to the right start. 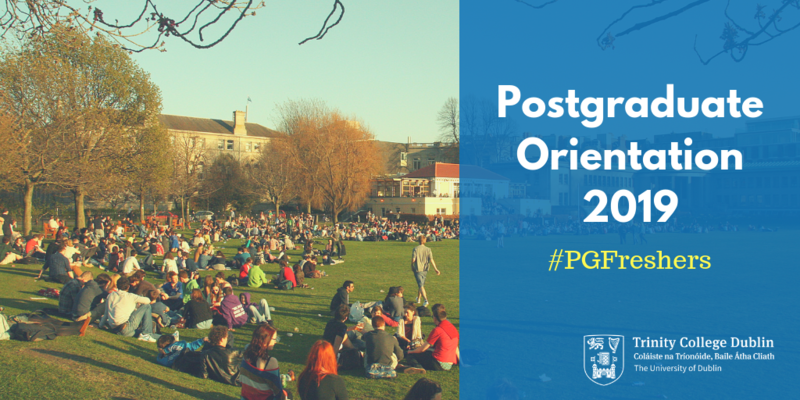 We have included all the important information you need to know prior to PG Orientation Week which will make things easier from the start with accommodation, immigration/visas, becoming a GSU Representative and of course the list of general orientation events and activities we have planned for Postgraduate Orientation Week 2017. You will receive an email at the end of August regarding more PG Orientation Week information (such as how to sign-up for some of our most popular events) and at this point, you will also receive the PG Orientation Handbook where all your queries about what AHSS means, how to sign-up to walking tours, etc. will all be covered. This information will also be available here on this webpage. You don't need to register to attend PG Orientation Week, but we do ask that for the events where sign-up is required, you do so as the events where sign-up is required tend to be full very quickly and we don’t want you to miss out. But you will receive more about that later this month. Looking forward to meeting you all in September.